It is fair to say that Quarto comes from a series of ‘smaller’ games. However, ‘small’ in this case may refer to the publisher (Gigamic), the number of players (2) or the amount of rules – but certainly not to the fun the game holds in store. Like many of its mates from the successful series (Quixo, Pylos or Quorridor anyone?) Quarto comes in two sizes – a regular-sized version and a mini version. 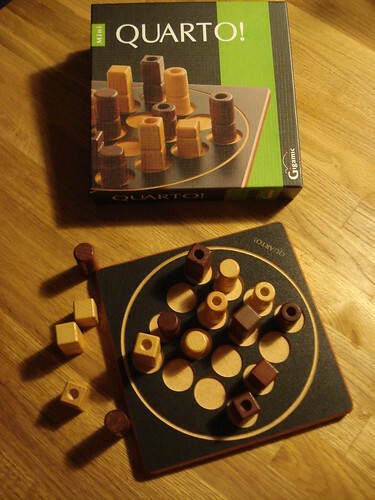 Unlike mini-size versions of many other games where the small editions are at most adequate compromises for travel purposes (Settlers of Catan or Ubongo come to mind), with Quarto you can’t go wrong with the small brother – and unless you want to put it up for presentation purposes, it offers way better value coming at pretty much half the price. By creating all possible combinations, you arrive at the sixteen different pieces, e.g. white, small, round and with a flat top. As should be expected, every piece has at least one common feature with all but one other piece – taking the above mentioned example this would be coloured, large, squared and with a hole engulfed in the top. So – what is the point of the 16 variations? First, it should be noted that unlike in Connect Four, Chess etc., the different colours (or any other feature) are not representing a certain player; both players use all pieces just the same. The objective, however, remains in place from Connect Four: get four of a kind in one row, straight or diagonal! Only in Quarto, four of a kind can relate to any one of the features, be it size, shape, the quality of the top or, of course, colour. Upon their turn the player puts one piece on a free spot of the grid. If this results in the creation of four-of-a-kind can announce ‘Quarto’ and point out the four pieces to claim victory in this game. Should the player fail to recognize that they met the winning condition, the other player can claim this line upon being handed the next piece by the opponent. Being handed the next piece by the opponent? Yes indeed, this is the last (but not least) interesting twist of the game: you do not get to choose the piece you want to use, but the other player hands you the piece you are then free to put at any free space on the board. Don’t see the point? Well, it is difficult to explain, but give it a try and you will soon notice that if the players can pick their own pieces, the games will be far less open and the second player goes for a blockade strategy, since (virtually) every row with three pieces in place and an open space results in victory. If the players can determine their opponent’s next piece, however, both players are encouraged to create situations where the other player has to allow for many factors – or in some cases may run out of safe places to put the piece just handed to them. Either way, there is no luck factor involved when you get to the bottom of it. So what’s to like about Quarto? Quite a lot actually. 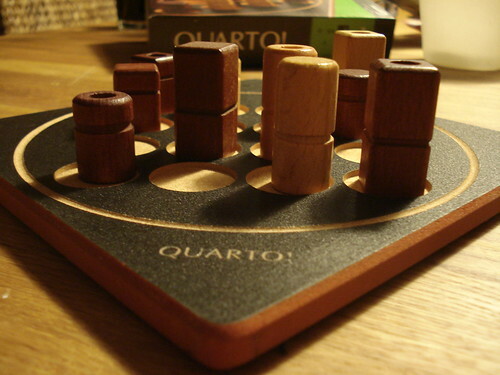 Quarto combines a very small set of rules with some nifty mechanics to a small game that takes so little time (depending on the number of pieces placed (before someone gets a Quarto or before the board is full) and the amount of thinking, games range from less than five to 15 minutes maximum) that you absolutely don’t want to leave it at only one round. The mechanics promote an offensive approach (i.e. building rows with common features, looking to get the opponent into tricky situations ) and since strategies are always influenced by the pieces you get from the other player, you don’t tend to run into standard situations or scenarios. What’s not to like about Quarto? Preciously little. You apparently can’t entertain large groups, and probably won’t meet just for a round of Quarto on a regular basis – but it is more than adequate as a filler and will not bore you anytime soon. One small critical remark relates to the recommended age of the game, which is indicated with 6 an up; the feeling here is that 8 and up would be more suitable due to the four different features players need to allow for; however, no real-life test was conducted to verify this impression. These impressions were shared by a number of juries across the globe when the game was released. Awards like the Dé d’Or des Créateurs de Jeux 1989 (France) and inclusion in the Auswahlliste Spiel des Jahres 1993 (Germany) are just two of more than 15 awards and nominations the games has reaped. Oh yeah, and it comes with one of the cutest video explanations in recent memory.